There’s a lot of Smashburger talk lately, mostly because they’re busy on new locations opening up. It seems like we just went to the last opening in Rancho Penasquitos and now we’re gearing up for a new location in Kearny Mesa. If you’d like a chance to get a preview of the newest San Diego Smashburger location, you may enter to win a chance to attend the “Sneak Peek Party” on Wednesday, September 7, 2011 from 5:30 to 8:30 p.m. by emailing your full name, home address and mobile number to smashburger@ellecomm.com . Subject line should be titled “Kearny Mesa Sneak Peek Party.” Guests will be selected at random from the pool of entrants. Guests will be selected by Friday, September 2, 2011. Before you head down to your closest Smashburger location, I’ll let you in on a little secret: San Diego Smashburgers have their own secret menu!! Did you know this? I certainly did not. It may not be as extensive as other places, but it’s certainly appealing to me and you can bet I’m going to try ordering one of these the next time I’m there! 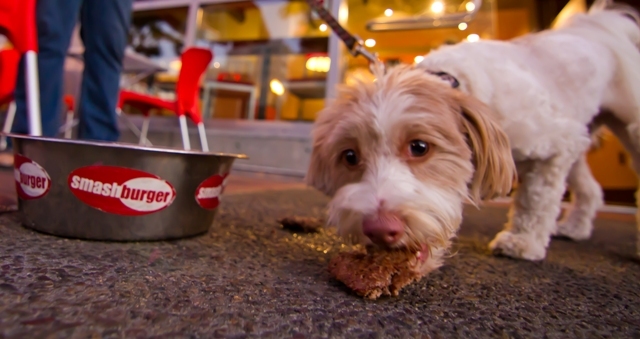 Fido Style Smashburger – this dog-friendly patty is made with an unseasoned 1/4 pound, 100% fresh, never frozen, certified angus beef patty served in convenient bite-sized pieces and on a fido-friendly plate. To order the item, guest simply need to request a Smashburger “Fido Style,” at the price of $2. PB&J Shake – this shake combines the Haagen-Daz Nutter Butter and Strawberry shake to create an irresistible Peanut Butter and Jelly flavor for just $3.99. Sin City Smashburger – originally crafted with the Vegas ‘city that never sleeps’ lifestyle in mind, it features 100% fresh, never frozen, certified angus beef, placed on an egg bun, then topped with a fried egg, applewood smoked bacon, melted American cheese, grilled and haystack onions, and the signature smash sauce. (This Smashburger is served for breakfast at the East Village location from 7 a.m. to noon and available for lunch and dinner at all other locations). I love that the Fido Style Smashburger is made with an unseasoned patty and even cut up for your pooch. All the Smashburgers I’ve been to have patio seating, so now your pup can enjoy a good burger with you! 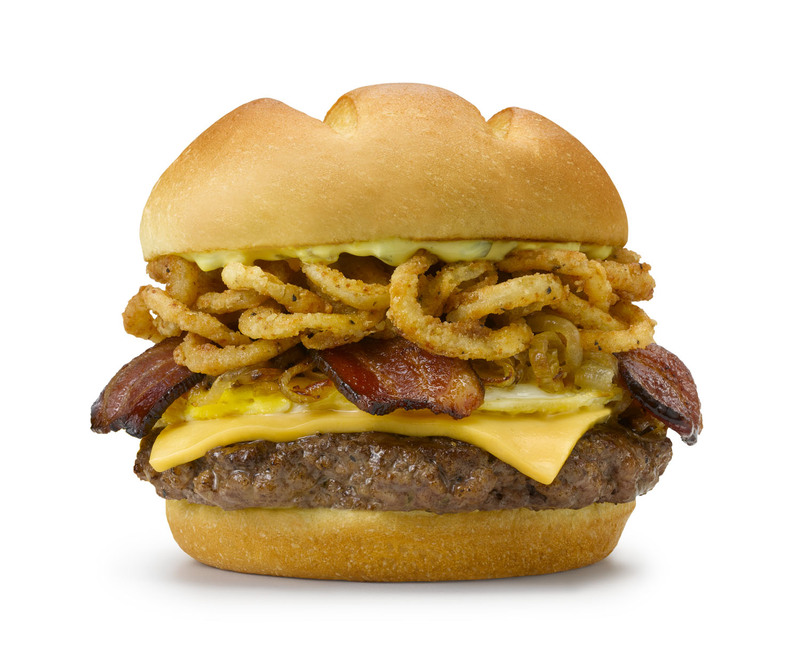 And the Sin City Smashburger has just about everything I love on it – fried egg, bacon, cheese, haystack onions… yum yum yum. Maybe there’s not enough room for avocado on top of all that? Have you ordered anything off the Smashburger secret menu? Anything you’ve come up with that should get added to it? This entry was posted in food, restaurants and tagged burgers, kearny mesa, secret menu, Smashburger. Bookmark the permalink. Okay, now I want to take my crazy little dog to Smashburger. That photo is so cute! I totally want to order a little burger for my dog! Ah you beat me to it! I have this almost same write up ready to post soon after Dara told me about the secret menu. I really really want to try the Sin city. The Sin City burger sounds so good! Okay, I’m getting a fido style for the pooches cuz that’s just too cute!